Let’s Grow Co-ops in 2018! As we charge forward into 2018, it’s exciting to look back and celebrate some of the exciting successes of our Member Food Co-ops. As more people across the Northeast become interested in local, democratic ownership and more inclusive economies, we’re seeing existing food co-ops grow and start-ups open their doors. Morrisville Food Co-op in Vermont became our latest start-up member to open its doors, growing our community of food co-ops across the Northeast. Among the anniversaries to celebrate in 2018, Fiddleheads Food Co-op in Connecticut and River Valley Co-op in Massachusetts will both celebrate 10 years since opening their doors; and City Market, Onion River Co-op (VT) turns 45! Urban Greens Food Co-op, a member start-up in Providence, RI, plans to open their doors this year! Here’s to a Co-operative New Year in 2018! The Neighboring Food Co-op Association (NFCA) is excited to start off the year with a NEW position and NEW staff member! We are excited to share that Suzette Snow-Cobb has joined our staff as Sourcing Coordinator. 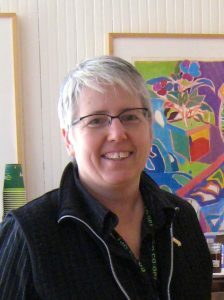 Suzette has been involved with food co-ops since the mid 80’s, and worked with Franklin Community Co-op for 20 years.She also served as NFCA’s Board President from 2016 to 2018, and currently serves on the board of the Valley Co-operative Business Association and as Stakeholder Director for Valley Alliance of Worker Co-ops Board of Directors. She holds a Master of Management: Co-operatives & Credit Unions from Saint Mary’s University, Nova Scotia. Suzette will focus her efforts on our Farm to Freezer and Cave to Co-op programs; we are thrilled to be growing our capacity in this important part of our work! “I’m excited to work with our members and NFCA staff to grow these programs and continue to expand and promote innovative sourcing projects to come,” says Suzette. Welcome Our Newest Member Co-op! The Neighboring Food Co-op Association (NFCA) is proud to welcome High Falls Food Co-op in High Falls, NY, as its newest member co-op! Since 1976, the High Falls Food Co-op has provided their community with healthy food at the lowest prices possible. Started by a few hungry people seeking good organic produce, the Co-op is now a flourishing community hub with 1,400 members and growing every season. For more than 40 years, the High Falls Food Co-op has served its members, vendors, and their wider community. They provide fresh produce to customers from over 100 local growers and vendors in the Hudson Valley. The Co-op is a group of local people working together, committed to an economic model that puts ownership in the hands of the member/owner community. To Serve the Common Good by working together to provide a sustainable economic model that follows fair trade practices and supports the community as a whole. To Stay Local by buying from suppliers, growers, and vendors regionally whenever possible. To Provide the Best by offering a wide range of healthy and/or organic products in addition to those produced locally or regionally in order to best serve the needs of our members. To be an Educational Resource for our Owner/Members and the community on nutrition, wellness, and issues that impact the environment. 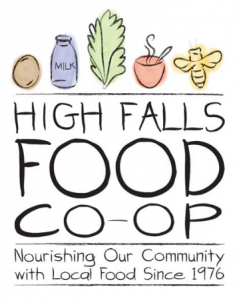 Please visit our website for more information on High Falls Food Co-op and all of our Member Co-ops! In Neighboring Food Co-op Association (NFCA)’s November newsletter we announced the launch of the J. Kevin Crocker Scholarship Fund for Education in Co-operative Enterprise. This new fund was established to honor J. Kevin Crocker, a senior lecturer in the UMass Department of Economics, for his service, dedication and contribution to co-op education, and particularly to the development of the Certificate in Applied Research on Co-operative Enterprises at the University. 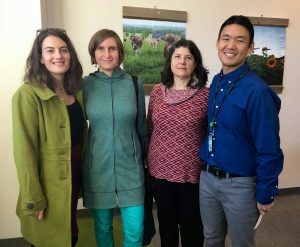 Resources from the Fund will support internships with the Valley Alliance of Worker Co-ops and the Neighboring Food Co-op Association, as part of this unique certificate program though the Department of Economics. We are saddened to share that J. Kevin Crocker, 65, died peacefully at his home on January 8th, surrounded by his devoted family. In addition to serving as a senior lecturer since 2012, Kevin was the department’s chief undergraduate advisor and honors program director. He joined the department in 2005 as lecturer, and served as academic advisor beginning in 2007. Kevin was both an optimist and a realist, as well as a practitioner whose job experience included membership with a worker co-op auto repair shop. He was also a colleague who was always ready to provide feedback and support as I learned the ropes as an adjunct lecturer at UMass, and a friend as I wrestled with my own health issues over the past year. It is important to remember that we do not do our work alone, and I am grateful for the opportunity to have gotten to know Kevin over the past few years and to be part of the effort to honor his memory. Kevin was the son of Almon and Mabel (Tardif) Crocker. After Mabel’s passing, he was raised by his sister Arleen (Crocker) DeFazio and her husband Enrico DeFazio. He is survived by his wife Gwen McClellan; his children Arlen, Declan and Liam; daughter-in-law Lauren; and siblings Donna Interlande, Sheldon Crocker and Sheila Newton. In lieu of flowers, his family has offered that contributions can be made to the J. Kevin Crocker Scholarship Fund to support his commitment to co-operatives and to undergraduate internships with co-operative enterprises through the Department of Economics. Contributions can be made to NEFU Education Foundation at www.newenglandfarmersunion.org (indicate donation is in honor of “J. Kevin Crocker”) or by mail to NEFU Education Foundation (with “Crocker Fund” in the memo), 176 Avenue A, Suite 2, Turners Falls 01376. Looking for a great, local cheese to kick off the year? 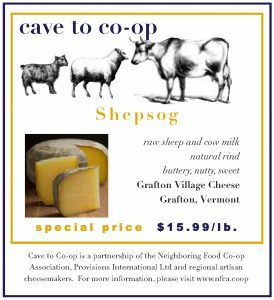 There’s still time to grab some Shepsog from Grafton Village Cheese at your local food co-op. The aromas of cultured butter and fresh buttermilk, alongside bright flavors that are lemony and sweet, with notes of caramel and a clean, nutty finish. While bad actors in private industry pose consistent threats to the integrity of the organic food label, the federal government should not. Yet a recent decision by the U.S. Department of Agriculture (USDA) to withdraw the Organic Livestock and Poultry Practices (OLPP) rule does just that, and it should be reversed immediately, according to National Farmers Union (NFU). On January 17, the NFU Board of Directors approved a resolution urging USDA to make the OLPP rule effective immediately. The Board noted this action is vital for both the integrity of the organic label and the well-being of the family farmers who adhere to strict, voluntary organic standards. NFU also submitted public comments today in favor of putting the rule in place.